It all started in the 1960’s with the creation of a new science, a new occupation and new methods in dog training. Still in the middle of the 1960’s a dog with a behavioral problem, like aggression or fear, was classified as a dog with mental disorders and usually put to sleep. In a leading dog book at that time only half a page dealt with problem dogs. The conclusion was that if force didn’t cure the dog, it was mentally bad and the only solution was to kill it. Obedience training has it’s roots in military training and discipline. Heeling for example, is reminiscent of the military drill. It was tough on dogs, walking sometimes nearly an hour without pause. Punishment for wrong behavior was the rule and rewarding good behavior was the exception. Harsh jerks on the leash, pinch collars and choke chains were used in the exercises. Dogs became very submissive by this training, and obeyed out of fear of punishment rather than a willingness to cooperate. In this atmosphere I began my career – as an opponent against the harsh ways to raise and train dogs. Also I objected to not giving dogs with problem behavior a fair chance to change with training instead of being labeled as “mentally insufficient”. I had earlier found that dogs that seemed to be afraid of people really were not afraid at all. They reacted to the unintentionally threatening body language of strangers, for example eye contact and walking right up to a dog. I was able to show that these dogs were not disfunctional in any way. This was considered a new landmark in dog psychology. When my first book was published in 1971 (Problem dogs and dog problems), it was considered to be a break through in dealing with training problems, and the introduction of a new science, “dog psychology”, However, it would take a couple of decades to be fully accepted. In 1974, my second book (Happy obedient dogs) was published. It was dealing with “every day obedience”, not the ordinary training that had been prevalent up to this point. It was also considered as ground breaking, because it pointed out a completely new type of training, as opposed to the military type of training. During my career I have persistently opposed all harsh methods in dog training and always tried to present alternatives to such methods. With an uncompromisable obstinacy I emphazised that any form of violence never is necessary in teaching dogs, whether it be obedience or correcting problem behavior. I’ve never used tools like electric collars, pinch collars or whips, that were, and still are, being used by some dog trainers. In the 1970’s I pointed out the importance of a code of ethics, or ideology, in raising and training dogs. This was the starting point for many training clubs and trainers in Scandinavia to begin to declare their ideology in advertisments and hand-outs, so dog owners would know what to expect from training courses. This non-violent ideology created an approach to dog training that inspired the creation of new methods and a better knowledge in ethology. Dogs’ wild ancestors, for example, seldom display violence in their relations and the relation between mother and puppies is very affectionate (Mother and pups, 1988); a deeper knowledge of learning psychology and focus on causes of behavior problems, rather than methods of coping with the symptoms. Today little or no training of problematic behavior is necessary, because there are so many determinants of problem behavior, and devoting efforts to change and correct these usually is enough to change the behavior of a dog. I have devoted much of my time into mapping the determinants of, and contributors to, different problem behaviors and succeeded in the construction of some psychological “tools” that are used by well-educated animal behaviorists today. Through follow-up studies and research I discovered many different causes behind problem behavior in dogs. My study from 1978 (Dogs rest too much) showed that about 40 % of dogs rest at least 20 out of 24 hours . Therefore, I created the “stress analysis” which shows the rate of understimulation, among other stress factors. I also showed that there are some 20 determinants causing aggression, the most potent being pain. Therefore, I created “pain analysis”, solely based on behavioral parameters. I also created methods to analyze hormonal and nutritional deficiences. Those are now used as a tool by well-educated dog psychologists. Among the many different causes of pain, “athletic inuries” are most common. In a study (Back problems in dogs, 1994) I was able to show that spinal problems are just as common in dogs as they are in humans. Problem dogs have significantly more of these deficiencies. In 1989 I was commissioned by MANIMANIS, Sweden (Part of the the internationally recognized IAHAIO organisation advancing the field of human-animal interaction (www.iahaio.org), to train the first service dog in Sweden. “Lajban” and her owner have been featured in TV-programs, radio and newspapers. A video about “Lajban” can be seen on youtube. Click on the link below to see the film. After the training of “Lajban” in 1989, I introduced the “Service- and Signal Dog Team society, a non-commercial association of trainers, physically disabled and those with impared hearing to promote this special dog training. One basic principle of this training is that the disabled person, i.e. the dog handler, is very much involved in the training and as such in control of decisions regarding what kind of services they wanted from the dog. The role of the dog trainer is to help to find ways for the disabled person to train his or her dog. This concept has proven to be very successful, and the disabled person becomes very active – not only in training but it also reflects in their every day life. But it is emphasized that the physical help from the dog is just a small part of the positive side of a service dog. To be able to enjoy a close and warm relationship is most important. Modern research show that people profit medically, psychologically and socially from the relation with dogs, and disabled persons should not be excluded from this wonderful possibility. This study is based on a questionary sent out to veterinarians and animal hospitals in the Stockholm area, asking them to state how many dogs that were destroyed during 1968, their age and of what cause. It revealed that many dogs were destroyed of causes not related to the dog, but to the owner, “convenience euthanisie”. My study was widely published in newspapers in Sweden. This study was my dissertation paper for my Master of Science in Psychology exam (MSc). It showed, among other things, that the environment a dog lives in has a dramatic influence on its behavior. It was published in a popularized version in my book “Hund och Människa”, 1974 (Dog and man). The result of the study started a debate that is still going on in Scandinavia and it was referenced to in various articles and books. This was a very small study, consisting of twelve dogs that were aggressive against mailmen. I conducted it just to test a new training method I had developed. It was only published as an article in the dog magazine “Vi Hundägare” (Us Dogowners). Every day I sent an envelope containing a treat, adressed to the dog in the household. All dogs in this study associated the treat-envelope with the mailman and after two weeks they were no longer aggressive. Since that time, this has been the most used and the most effective training method for this problem. This study was conducted with a questionary to 215 dog owners in the Stockholm area. They were asked how often and how long their dogs were walked, how much time they spent active in the yards (if there were any) and the amount of time they were activated inside the house. I added the acitive times during a 24 hour period. The rest of the time the dogs were resting and building up energy. The owners also were asked if the dog had any problem behavior and if so, which and how serious it was. The result showed that in a normal population of dogs nearly 40 % rested 20 hours or more, which meant they were active four hours or less during a 24-hour period. In this group the majority of the dogs were problematic. More active dogs in the study had lesser problems. This studie was the basis for my new training concept “mental activation”. I am happy to say that it has echoed all over the western world. Today, the idea that dogs also need mental activation is beginning to be acknowledged also in Northern America. The study was followed up by two others, in 1985 and 1986. The 1985 study consisted of 374 dogs and confirmed the results of the first one. The 1986 study consisted of 342 problem dogs and revealed that 86.5 % of the problematic dogs rested 20 hours and that 26 % rested 22 hours per day. Most of these dogs were “cured” by mental and and physical stimulation. This was a small study that created lots of attention. It was done with 14 dogs that aggressively protected their food. I wanted to test my hypothesis, that such a simple thing as sugar could cure the problem. I had observed that most dogs that protect their food also were very hungry, so I concluded that hunger was the prime motivator. Because of the fact that hunger and satiation are experienced in the brain, it is easy to give a dog a sence of satiation by giving it some fruitsugar 10 – 15 minutes prior to feeding. The result was astonishing. In one week the protective behavior had disappeared in ten of the fourteen dogs in the study group. The remaining four dogs showed improvement. The study has been published in “The American Newsletter for the Animal Behavior Society”. This simple method is now in use by well-educated dog psychologists in Scandinavia as the most efficient therapy for this problem. In this study, made in cooperation with the University of Örebro, I compared the reactions between dog owners and parents when their dogs or children were in dangerous or in threatening situations. It revealed that the reactions between the two groups, dog owners and parents, were very similar between. The conclusion was that dog owners feelings for their dogs are equal to “parental” feelings and should be taken seriously, for example when a dog dies. The result of the study has been widely spread in newspapers and magazines and referred to in books. I presented the study at an international conference in Boston, Massachusetts in 1986. In this study 149 dog breeders were asked questions about the relationship between dog mothers and their puppies. Contrary to what many dog experts and trainers propose, the study showed that dog mothers are extremely gentle and kind to their offspring. Trainers who advocate harsh training methods often tell dog owners that dog mothers are strict with their puppies, using this is an argument for the owners to strict as well. The studie is often quoted and was published in “The American Newsletter for the Animal Behavior Society”. This study was mainly aimed for veterinarians, behavior consultants and others interested in the analyses and training strategies used by me and my students. The study revealed the importance of analyzing the causes behind a problem behavior. Using these tools to cure a dog from its problem behavior has proven be successful. That dogs have back problems came as a suprise to most dog owners, trainers and others. And that the occurence of these problems equals to that of man was also suprising. In this study I could not only show the frequency of the problem, but also reveal the different causes. My study showed that dogs often end up with chronic neck problems as a result from harsh pulling on the leash, which unfortunately is the most widespread training technique. International Symposium on Dogs, arrangerad by Animal Learn, Germany 2002.
International Symposium on Dogs, arrangerad by Animal Learn, Germany 2004. From 2004, after returning to Sweden from California, I continue to travel around world for lectures and seminars as well as leading courses for new dog psychologists. I am often interviewed by the press, radio and TV and keep busy writing new books and articles. Some of my poems about dogs became so popular that they were printed and sold through “Jycke-Tryck”, which also published some of my books. One of the poems was read in Swedish Radio Program 1 in the early 1990’s. For over ten years I was hired by the Swedish Kennel Club to write a column in their magazine”Hundsport” (Dog Sport). I am also a frequent writer for the Danish magazine “Dyrefondet” (Animal protection society). During the years I have developed a world-wide network of contacts. I have been invited by several organizations in several countries to hold seminars and lectures. I am also functioning as an adviser by correspondence to organizations in different countries. As the first dog psychologist, at least in Europe, I began to work with chiropractors, naprapats, physical therapists, homeopaths and biopats. In the early years, the responses from veterinarians were mostly negative. But after my statistics showed that many problem dogs were in pain related to muscles, joints, and the backs, the climate for alternative medicine in diagnosing and treating dogs changed. Today many veterinarians work with representatives from other fields of medicine. Many dogs have a fear of fireworks. I have worked in different ways to help dogs and dog owners regarding this. I wrote a pamphlet and then a book on how to help dogs, both with preventive actions and ways to cure firework trauma. (“Stress, anxiety and aggression in dogs”) This resulted in a nationwide recognition of the problem with fireworks. A joint effort is now enforced between police, firefighters, humane societies, the Swedish Kennel Club, local and national dog clubs, senior citizen organizations, home and school associations and others. They are working to lessen the damages of fireworks in Sweden. This is also taking place in other Scandinavian countries. In 1986 I developed something called “Kennel-Data” for breeders. It was a method based on a questionnaire, where you could test a dog’s personality. Before that I had tested the method on the outcome of different breeding combinations. In 1983 I discovered that dogs were able to detect mold in buildings. This lead to a new niche for working dogs and I developed a new training method. To make the mold detecting dogs more effective, I developed the “Discrimination Training Apparatus”. This training makes it possible to put different objects in different compartments and teach a dog to discriminate between smells. In the early 1980’s I inspired a Danish man, Kurt Lind Jorgensen, to develop “the Buster Cube”, a mental activation toy for dogs- This is now a big seller all over the Western world, and sold by Kruuse A/S, a Hills Company. At a seminar in Denmark I spoke about the importance of mental stimulation and that an activation toy for dogs would be a very good thing to develop. A few months later Jorgensen called and told me that he had made such a toy. In the late 1970’s I pointed out that many dogs are problematic because of hormonal deficiencies. This was met with skepticism from the established dog community and from veterinarians. I especially pointed out that the thyroid gland often was disfunctioning in many dogs, often at remarkably high frequency in some breeds. I also had some tentative statistics to back this up. This resulted in an increased interest of hormonal deficiencies, especially among some veterinarians. 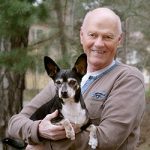 When Mats Larsson, a Swedish veterinarian, in the early 1980’s made a thorough study on the thyroid gland in dogs, there was a revolutionary breakthrough in this field. Today there is a big interest and no resistance to this line of thinking all over the world. I also constructed a “masculinity test” that is in use by many animal behaviorists in Scandinavia, that reveals if a problem behavior is caused by an abnormal production of testosterone. During the 1970’s I helped several humane societies to set standards for what was to be considered good living conditions for dogs. Earlier these societies had their emphasis on physical abuse of animals. My work helped them to focus on the psychological life quality too. These standards have been recognized by the Swedish (and others) Kennel Club, materialized in a poster (“Hundens Rättigheter”; “The rights of dogs”), sent enclosed in the Kennel Club magazine “Hundsport” to every member and also sent to different dog clubs and humane societies. The standard is based upon canine ethological and psychological needs, depending upon species characteristics. As for example, a dog is a highly social animal, with a great need for company and closeness to its family. Therefore we must not leave it alone for too long or forbid it to be inside the house together with the rest of the family. The agreed upon time limit for adult dogs to be alone in Sweden is set to five to six hours at most per day. Of course there still are dogs alone at home for more than that length of time, but the majority of Scandinavian dog owners now recognize the time limit and many of those who cannot solve the problem otherwise, have their dogs in day care. This has resulted in a lot of dog day care centers and has created several work opportunities.